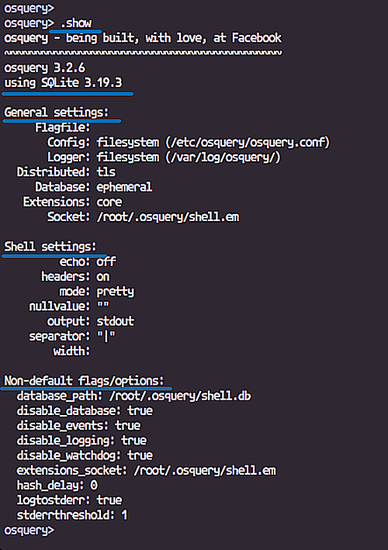 Osquery is a multi-platform software, can be installed on Linux, Windows, MacOS, and FreeBSD. Osquery allows us to explore the operating system profile, performance, security and many more metrics by using SQL-based queries. In this tutorial, I will show you how to install osquery on the Linux distributions Ubuntu 18.04 LTS and CentOS 7. We will install osquery, learn how to use the 'osqueryi' interactive mode, and how to monitor a live system using osquery. osquery provides its own repository for each platform. Ithis step, we will install the osquery package from the official osquery repository. Install the osquery package on Ubuntu. Install the osquery package on CentOS 7. Wait for all packages to be installed. osquery provides two main interfaces to the users, osqueryi, and osqueryd. 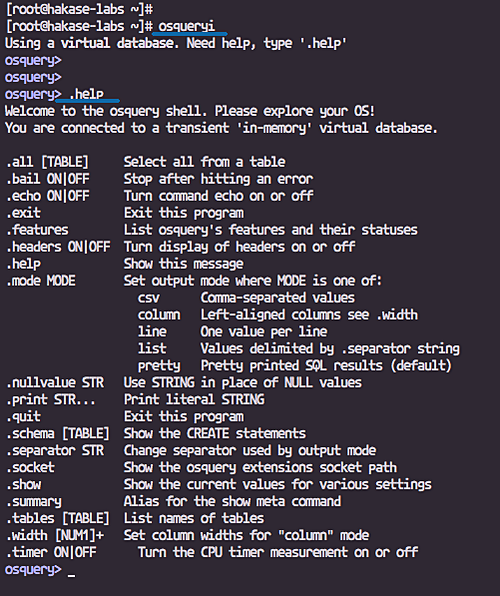 osqueryi is the osquery interactive query console. 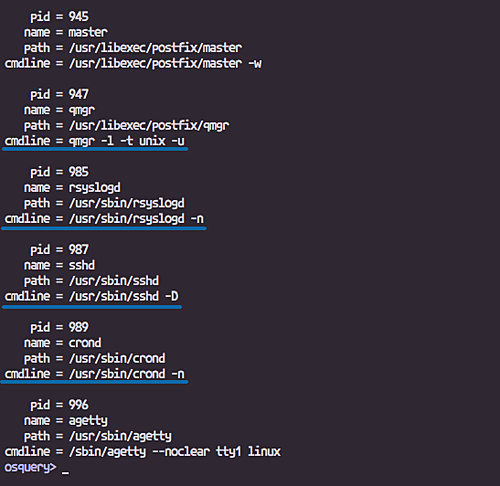 It's like the 'mysql' command shell on the MySQL and the 'psql' shell on PostgreSQL database. In this step, we will learn the basic usage of the 'osqueryi' interactive mode. 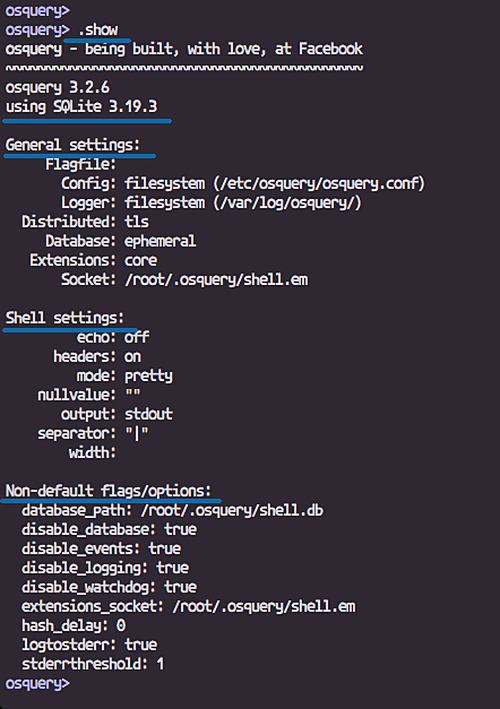 Type the 'osqueryi' command on the server terminal, and you will get the osquery interactive console mode. Next, we will learn about the basic command of the osqueryi console mode. Show all basic available commands on the interactive mode osqueryi. Show the current osquery configurations and settings. Osquery provides multiple view modes to show query results. The default mode is the 'pretty' mode. Now we'll change the view mode of query results, for this guide, we will be using the 'line' mode. Osquery exposes the operating system as a relational database system. All info about the system is stored in the osquery tables and we can explore the whole system info by querying all available tables. 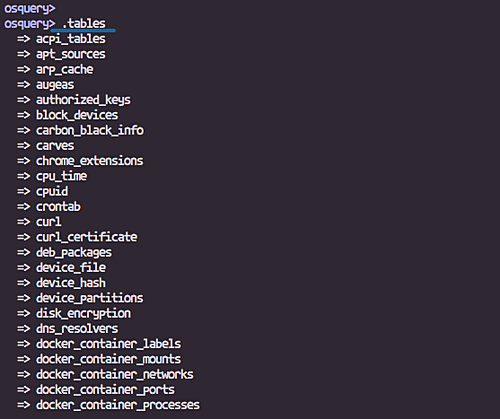 To get a list all available tables in the osquery, run the command below. Once we know all the available tables in the osquery system, we will look at the columns. Use the following command to get the schema (columns, types) of tables. And you will get all schema columns of the table. In this step, we will monitor a live Linux system using the osquery. We will monitor the system profile info, users, network interfaces etc through the osqueryi interactive mode. Show details about the system hardware. Show the current operating system info, including the os version, platform, os patch, and codename. 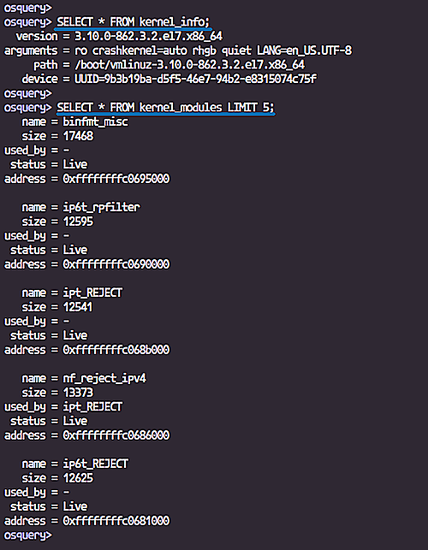 To check the kernel info of the system, osquery provides the tables 'kernel_info' and the 'kernel_modules'. 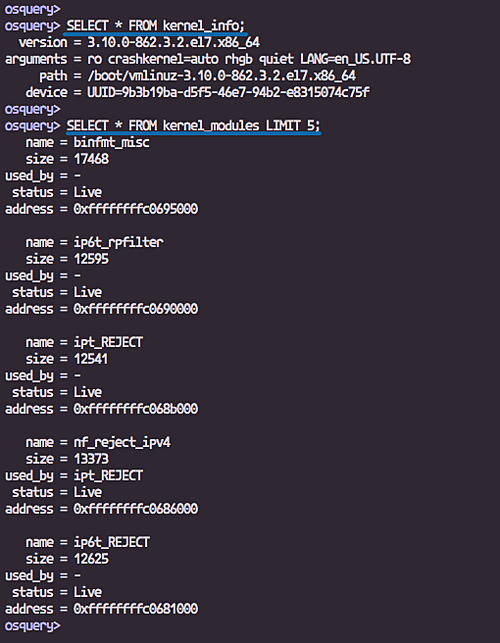 Show the kernel used by the system. 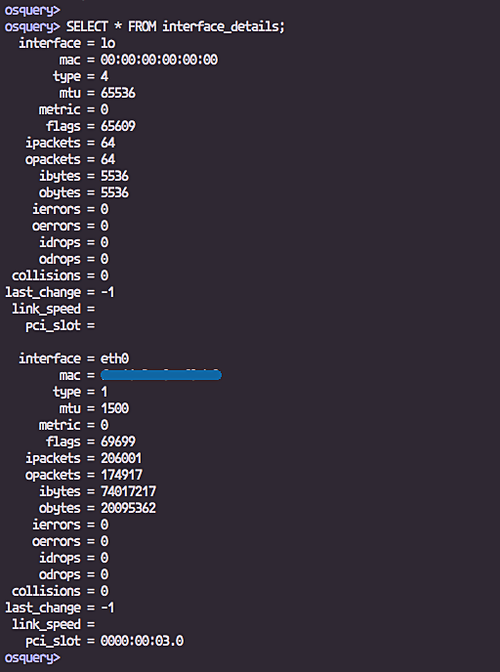 Show all loaded kernel modules on the system. osquery provides tables for checking repositories and installed packages on both Linux Ubuntu and CentOS. On Ubuntu, we can check the available repositories through the 'apt_sources' and check packages installed through the 'deb_packages'. Check all available Ubuntu repositories. Check all packages installed using the deb_packages table. Show only the name of package and version. For a specific package, add the name filter. 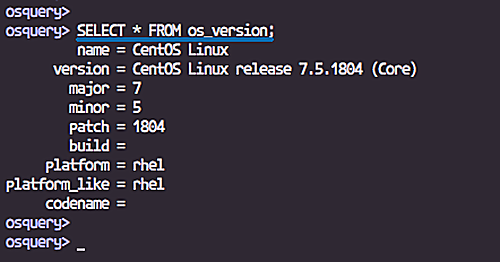 On CentOS, we can check the available repository through the 'yum_sources' and check packages installed through the 'rpm_packages'. Check all available CentOS repositories. Check enabled repository by adding the 'enabled' filter. Check all packages installed using the rpm_packages table. For specific package name, add the name filter. We can use the mounts table to check all details about the system drive, including free inodes, flags, type etc. Check all disks mounted by the system. For the specific type of device. Checking the system memory in bytes. 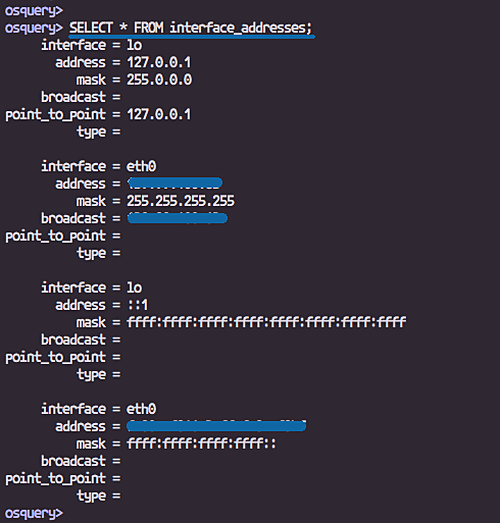 Checking the network address using 'interface_addresses'. 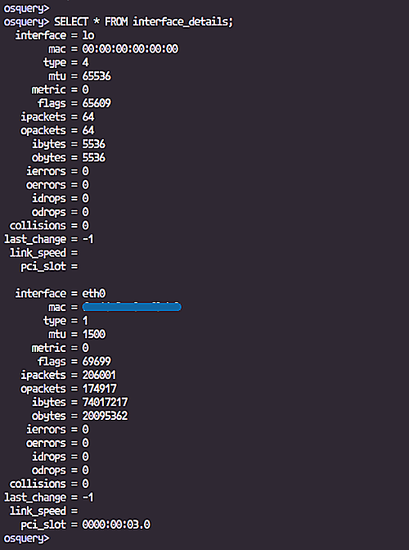 Checking the network interface details using 'interface_details'. 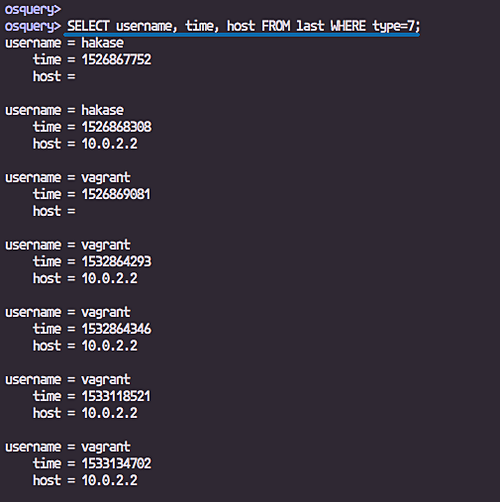 osqery provides detail tables for checking system users. 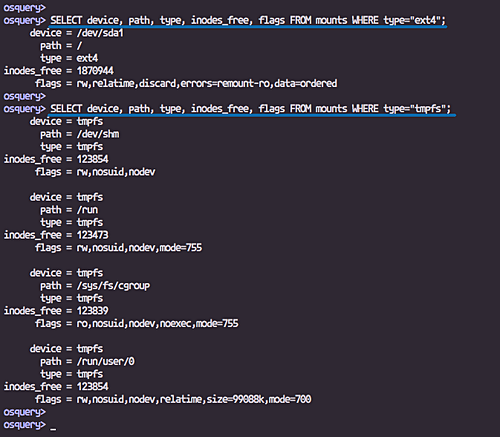 We can use the 'users' table to check all users on the system, using the 'last' table to check users last login, and using the 'logged_in_users' to get the logged in user with the active shell. To check all available users on the server, use the 'users' table. For normal users, we can specify the uid to '>=1000'. To check the last login users, use the 'last' table. For normal users, fill 'type' to '7'. 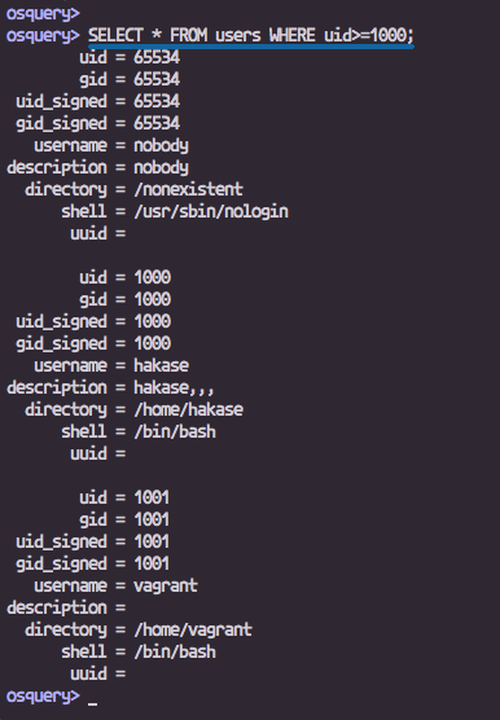 Checking the logged in user with active shell, use the 'logged_in_users' tables. 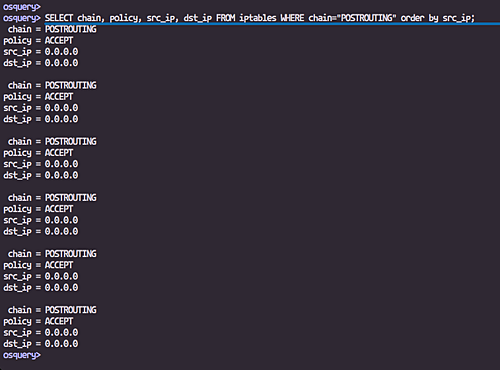 With the 'tables' table, we can check all available rules of the firewall, including the chain, policy, src/dst IP and port etc. Specify the rule using the custom query below. We can check all application process by using the 'processes' table. It provides detailed info about the process including pid, name, path, command etc. Basic processes query for checking all running apps. Specify columns for pid etc, path, and the command. Check available cron job and time of script run using the 'crontab' table. SUID (Set owner User ID up on execution) is a special type of file permissions given to a file and mostly binary executable files. Check all available said binary file. Specify the username and group name. And all the above is the basic Linux system monitoring using osquery. "Created by Facebook". Does this fact reassure anyone?